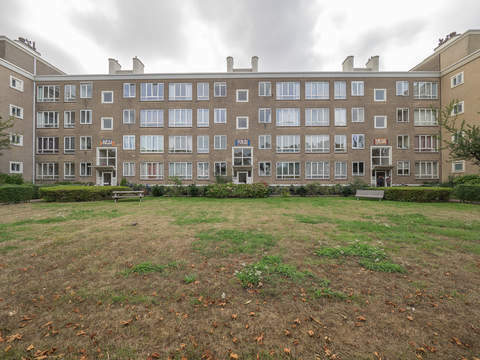 Eindstede 129 Price asked € 385.000 k.k. Located in a quiet street with a lot of trees, beautiful semi-detached house with garage, 4 bedrooms, lovely front and back garden with shed and back entrance. Architect Kloet & Van de Merwe. 6 solar panels on the roof. Living surface approx. 142 m². Eternal lease hold land. Via sunny front garden, entrance, hall, meter cupboard, toilet with hand basin, via inside door access to the garage approx. 5.75 x 2.69 with a flip over door, washbasin (close-in boiler) and electricity. Via door access to the open kitchen approx. 3.55 x 4.02 with several appliances, 4 burner gas cooking top, extractor hood, oven, dishwasher, fridge-/freezer combination, double sink and a spacious L-shaped living-/dining room approx. 8.70 x 7.10 which is nicely located along the beautiful back garden approx. 9.06 x 8.31 with afternoon sun, facing northwest with wooden shed and back entrance. Spacious landing, back bedroom approx. 3.39 x 4.23, bright front bedroom approx. 4.24 x 3.64, bathroom approx. 2.50 x 2.18 with bath, shower, toilet and design radiator. Front bedroom approx. 4.39 x 4.23 with door to sunny balcony facing southwest. Space with washer-/dryer connection, mechanical ventilation and central heating system. Back bedroom approx. 4.23 x 2.71 with windows over the full width. Hot water supply by central heating system and electric water heater (owned). Living surface approx. 142 m². The volume of the house is approx. 522 m³. Boulevard of Kijkduin, recreation area Madestein, several sports facilities such as tennis, soccer, hockey, horseback riding and handball. Public transport (Bus 21 and 25, tram 9) and main exit roads through Westland Road to A4, A12, A13 and A44.